Sited 250 ft above sea-level, the church when first built would have been a notable local landmark, opposite the windmill on the crest of the hill. Constructed of Kentish Rag with Bath stone courses and quoins, it presents a robust solidity and the 150 ft massive pyramidal spire is in smooth stone above the bright red roof tiles, the textured walls and the chequered gable of the porch. Mrs Georgiana Hannah Twells commissioned the church from William Butterfield, as a monument to her husband Philip Twells of Chase Side House, a banker and MP for the City of London. 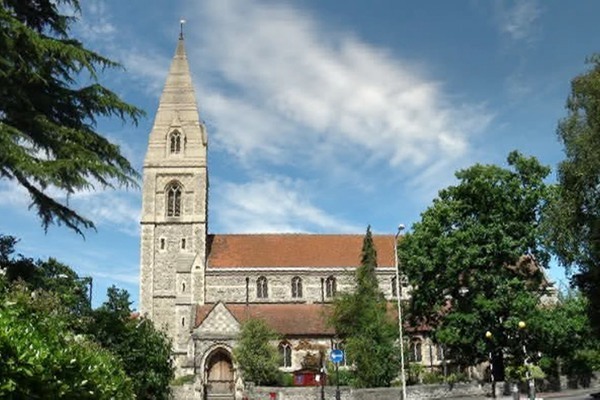 The foundation stone was laid in 1881 and the church was consecrated two years later. At this time the suburb was developing rapidly with the railway reaching Enfield Chase and there was a need for a substantial church serving the surrounding villas and smaller houses. Internally the church is expensively and elaborately ornate, and the wagon-roofed nave and aisles have white walls set off by dark wood, with a rich brown stone arcade. The stained glass is of a consistently high quality and includes a touching WW1 memorial in the north aisle. The traceried screen added in1898 at the chancel has been moved to the west end of the nave. 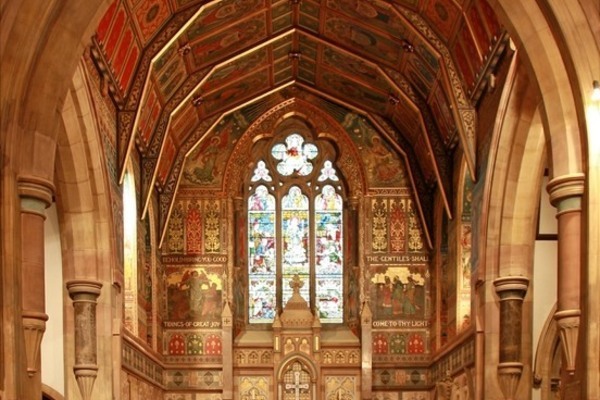 The sanctuary is adorned with sumptuous wall and ceiling paintings in dark colours and gilt in an elaborate scheme of Evangelists, prophets and patriachs, with scenes of the Incarnation and Epiphany. These are by Charles Buckeridge (1897) and those on the side walls by N H Westlake (1899). These were restored by Hirsh Conservation in 2012 with the aid of part monies from the Lottery. The chancel floor is handsomely tiled and the lower walls have rich marble inlay and gold paint. The side chapel in the south aisle was added 1907/8 by Allen Fairhead and Sons. The orginal ring of 8 bells was cast in 1883 by Spitalfields Foundry.These were replaced in 1999 (milleum) with new ones from Whitechaple Foundry. The Old bells were sold to Grace Church, South Carolina, USA.